Walk to the beach! Vanderbilt or Wiggins State Park. Best rental home in Vanderbilt Beach, Naples!!! Southern Exposure for sunny pool all day! A slice of paradise in the highly desirable Vanderbilt Beach area of Naples Florida. Three bedroom, two bath, 36 foot pool home with Jacuzzi spa in the upscale Vanderbilt Beach Estates neighborhood on the waterfront. Fish off your own dock or watch the dolphins jump in the bay. Two boat lifts right outside your door, take your boat out to the Gulf of Mexico in less than 15 minutes. Or, if you prefer the beach, its only one mile away, walk or bike in five minutes or less! Close to shopping, restaurants, and only 25 minutes from the airport. You are looking at a totally updated home, over $100,000 in improvements. New kitchen with granite tops, new cabinets, new appliances, and wood flooring. Both baths have been redone with granite tops, tiled baths and shower, and new fixtures. All new high end furnishings. New top-of-the-line Sealy pillow-top mattresses in all bedrooms. Gourmet kitchen stocked with everything you need to entertain guests or yourselves. Best home for rent in Vanderbilt Beach! Southern exposure keeps you warm poolside sipping cocktails! Wi-Fi, wireless broadband Internet access! Weber gas grill, jacuzzi, bicycles, beach parking pass. BEST single family home for rent in the highly desireable Vanderbilt Beach area. Walk to the beach in this beautiful Naples single family home. 3 bedrooms, 2 baths, very large pool with Jacuzzi spa. Pool screen to keep out the bugs. Half way down a short street for privacy. Weber gas grill, bicycles, free W-Fi, and many more amenities. 3 minutes to the Gulf of Mexico! On canal with boat access to the Gulf. May dock boat right on property, no charge. Circular drive. Lots of parking. High Speed Wi-Fi and wired. Plenty, beach and pool towels too. Small and large. Tea kettle elec and stove top. Open to great room, dining room and lanai. Flat screens in every room. Century Link Prism TV with Hi Def. Pelican Bay Park with lighted clay courts less than 1 mile away. All on ground level. Very handicapped friendly. New commercial sized (145,000 btu) pool heater installed Feb 2012. This was a family trip to celebrate a 50th wedding anniversary with kids and grandkids. We made sone good memories on our trip. The house has a good assortment of beach chairs, unbrellas and sand toys for the kids while on the beach. We were lucky the beach was clean for swimming while we were there. The layout of the house was perfect for our family with the master bedroom on one side and the other bedrooms on the other. The kitchen was well stocked and open to the family area. We enjoyed our tine in the pool. The weather was too hot to use the hot tub. My wife and I had a great time in this home. We are fortunate to be able to travel to great locations and resorts, usually on business. Because of that, when we travel on "our dime" we're a bit picky about where we stay. 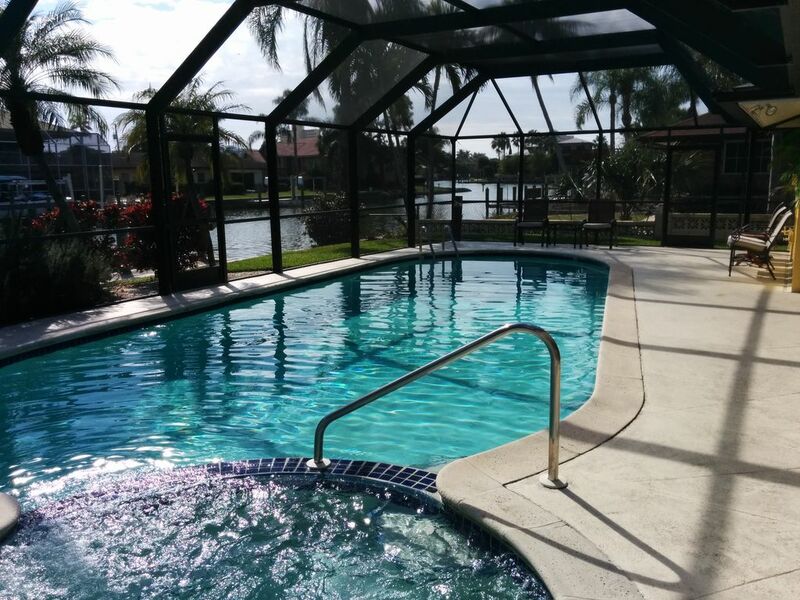 This home was attractive, comfortable and nicely furnished, and the pool area was great as well - we're glad we chose it. Owner was responsive when we had a couple questions. Convenient to beaches and restaurants. I wish we had stayed longer than our five nights, and I can see us coming back next year! We were coming to visit my family for the weekend and wanted a house with a pool for our children to be entertained after going to the beach in the morning. With 3 small children (under the age of 7), we simply cannot stay at the beach all day and require some cover from the sun to ensure safety for our kids. We spent a little more on this house than we wanted to because it was a little bigger, a little closer to the beach, and the pictures looked much nicer than other homes available on those dates. When we arrived at the home we immediately noticed the pool was green and not a place for anyone to swim. The ceiling has noticeable issues that have been patch fixed as it looks like there was water damage or leaking from the roof. The kitchen area has many roach traps on the counter as well as ant traps. The bathrooms have cracking through much of the tile work and also appear to have water damage patched up and not fully fixed. The light switch in the master bathroom has a gap between the top of the plastic and the drywall which would seem to be against electrical code. This house overall is nothing like the pictures posted on the website. When I called the homeowner to discuss the issue of the pool he mentioned that his neighbor had told him the pool was green the day before and that he had the pool company come out earlier in the day to remedy the issue. He also gave me the number of the pool company although they never returned my call or picked up the phone after 5 attempts to contact them directly. The owner also would not pick up my phone call after the first conversation we had which was disconcerting to say the least. After we decided that we would still unpack and figure out how to proceed, we noticed that the air conditioner was not really working. When we awoke (8 am) the air temperature on the thermostat showed 78 degrees and had moved from 83 when we arrived at 4pm the day before. I live in Central Florida where the heat is quite extreme and have 10' ceilings and have an air conditioner that within a couple hours moves from 81 to 73 without issue, so I know that a house with 8' ceilings should not have this type of problem with cooling. When I called the customer service group on Saturday morning, Stephanie was extremely helpful and showed great concern for my issues. They moved us to a hotel with a pool.The owner was obviously not interested in helping or admitting fault in any situation with this rental. Naples and the surrounding beaches experienced Red Tide (an algae bloom) this spring as it does every year. Being so close to the beach, the pools in the area are susceptible to this as well. I rely on my pool service company to step up their efforts this time of year to keep the pool in shape. As with most pool service companies they experience a high turn over in employees. As a result, my pool's weekly service was missed one week. I was notified by a neighbor that the pool was turning green and immediately got them there to shock it. This was the day before this tenants arrival. They/ pool company said it would be safe to swim 24 hours later. This tenant was only there for the weekend so apparently this was not good enough for them. They stayed for 15 hours and left. That afternoon the pool cleared up. The A/C unit is only two years old and works just fine. Have no idea what they are talking about. The house is currently occupied with no complaints. The nitpickng of the details of the house are exaggerated. The entire exterior of the home was just painted and the interior is scheduled for this fall. The pool pump and heater were just replaced in April. The entire pool deck was just painted in May. The home is in excellent condition, maintained professionally, and all the reviews confirm that. Despite their unfounded complaints I refunded them. They were tenants for 3 nights, not buyers of a $1.3 million dollar home. One of the worst tenants I've ever had. We spent 5 nights in May 2018 and enjoyed our time there immensely. The property is well-maintained and the house was spotless upon our arrival. The pool and spa are as advertised, and the heater system for them worked very well. Tony is an extremely responsive host, as well, and was gracious enough to respond to my (annoying) questions very quickly. The property is quiet, and while there are neighbors close by we rarely saw or heard them. The beach is a short bike ride away (probably a bit far to walk, if you're carrying stuff), and the house comes equipped with everything you'd need for the beach, as well. We're currently planning to return again. This home is an excellent bargain that I can fully recommend. We rented the house for 4th of July weekend and overall it was o.k.. Unfortunately when we stayed there there was an AC leak and for the 3 days and nights we had water dripping from the ceiling. Also, there was ant infestation in the kitchen and 3 out of 5 bikes were not usable. The owner Tony was apologetic but some of the things like bikes / ants can be prevented and when I spent $$$ I want to enjoy my time with family and not worry about ants getting into my food or wet towels all over the floor due to water dripping from the ceiling. Anyway, the pool and outside patio were very beautiful and we enjoyed our time outdoors. Also the house is located very close to the beach which is convenient. Sorry about the AC leak, as soon as you made me aware of it, I had two men there to fix it. As you know, if you are a homeowner, sometimes things break. I have contractors on standby to fix any issue ASAP. Typically I rent by the week so your short stay over a holiday was affected, sorry. In South Florida, there is no winter to kill off critters. If you leave food out in the kitchen or drop crumbs on the floor, you will get ants. The home is sprayed monthly for insects and I've never seen one there. Many tenants come from up north and are not used to this. Keep the food in the frig and you will not have ants. Bikes are serviced regularly. In the garage there are spare tubes and a pump. Occasionally a flat tire may need fixing. It's simple. If I'm made aware of it, I can send someone over. Your short stay over a holiday weekend for a 3 bedroom home, with private pool and spa on the water was $ not $$$. The Best Beach in Naples: Vanderblit!!! That's why the Ritz (and La Playa) chose it for their beach hotel. Homeaway typically miscalculates rates. Email owner for rates and availability.